This weekend was going to be a little different, on the way to Mustang Maniac. A good friend of mine has been badgering me to come and look at my car and of course Adam’s collection of cars. Gary turned up on time and loaded some bits into my car. Before we even had a chance to say hello we were in our way. We had a good catch up on the way down there with the radio on, we did decide that Joy Division tracks before 9 am when Gazza hadn’t even had a coffee yet wasn’t a good idea. The journey was quicker than normal, we arrived parked up and looked for Adam. After formal introductions it was coffee and cakes time in the boys club. 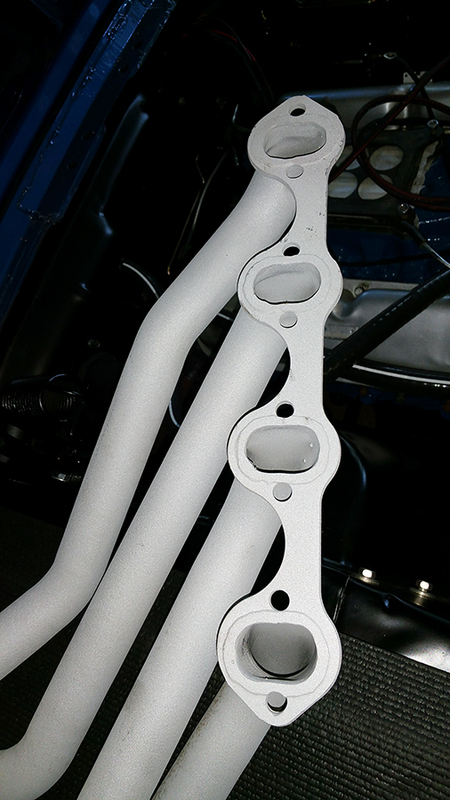 I spoke with Adam to see what was the plan for the day and decided that my aluminium coated headers were to go on the car then the rest of the engine parts. I got my headers from the storage area and took them to the workshop and prepared what I needed to do. Adam kindly took Gazza out on a little “road test” in the recently completed Shelby KR tribute. I must point out at this point I wasn’t to impressed as I ain’t even been out in that one yet. Jealous? Yep. Anyway Gazza came back looking quite pleased with himself and decided he was going to help instead of having joy rides all day. Yogi and Adam came over at this point to check all was OK, the left side header was going to be a problem as the 3″ pipe was tight and not going to fit. The answer was to drop the steering ram and try to get up to the block that way. I was a lucky boy, it just and I mean only just fitted in. We were thinking that the engine may have to come back out to get them in. 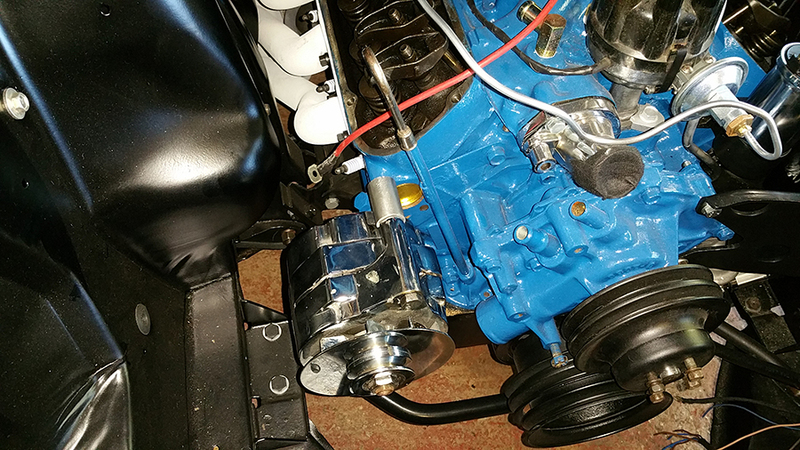 The spark plugs were removed and the rocker covers to give us as much space as possible to work in. We were going to try a new set of header bolts which are supposed to stop them coming undone with vibration. As it turned out the bolts were very tight to fit in place against the pipes. 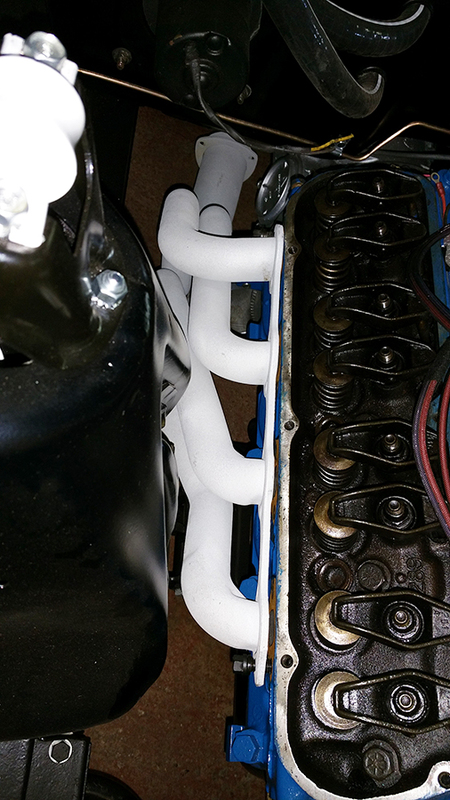 We held the headers in place with a couple of the bolts each end and dropped the gaskets in place. With the headers in place we gapped and put the spark plugs back in. Next was the power steering pump, coil and one wire alternator. All looking rather good, but there again I would say that wouldn’t I? Adam found me the a fuel tank sender a fitted it for me, it’s a tricky job and I forgot to take photos of it as I was holding the torch. Well, that’s my excuse anyway. All in all a good day and I help too. Thanks to Adam for letting me bring a mate to his yard. Cheers Gazza for your help. This entry was posted in General and tagged coil, headers, Mustang, Mustang Maniac, One man and his Mustang, one wire alternator, power steering pump, spark plugs, Yogi. Bookmark the permalink. I can’t believe that it was so tight to fit the exhaust headers in that huge engine bay. Makes me feel better because I’m always complaining that despite seeming big vehicles, whenever I need to do something on the Land Rover it invariablly involves trying to get to a bolt in the most inaccessible place! I know what you mean, no matter how big the engine bay somebody will always fill it up with something. Maybe, but those 26 horses won’t get stuck anywhere you care to go, I will. The bolts with the double grip washers are brilliant. They’re all over the loader/diggers I service and rarely is one missing. Nothing like a nice set of headers! Vroom! Vroom! Screeeeech! You will be able to “peal out”, an art lost with front wheel drive cars.